Pacific Roof Cleaning is proud to be featured as the cover photo of The Roof Cleaning Issue of eClean Magazine. That’s right, a whole magazine issue dedicated to roof cleaning, because it’s that important! The many benefits of getting your roof cleaned are especially highlighted in the article Power Washing: Let’s Talk Roof Cleaning, by the publisher, Paul Horsley. Your roof takes a beating from the elements, and moss and algae can destroy your roof if ignored. Horsley points out that having a clean roof increases long-term structural stability once moss and algae are gone; improves curb image, which means more business for business owners and a higher resale price for homeowners; and lowers long-term cost, since a roof will probably have to be replaced sooner without regular cleaning. However, power washing, as simple as it may seem, is not the best option for cleaning your roof, since high pressure can actually cause serious damage to the roof. “On too high a setting, pressure washers can blast shingles entirely off a roof, or simply destroy its ability to protect against the elements,” points out Horsley. Instead of power washing, roof manufacturer’s instructions generally suggest combining a low-pressure chemical wash with a low-pressure rinse. “To play it safe and save you money in the long run, your best bet is to hire a professional firm that specializes in roof cleaning,” Horsley recommends. 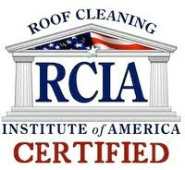 If your home, business or commercial facility is in the Santa Cruz, Monterey or Silicon Valley areas of California, Pacific Roof Cleaning is the first and only roof cleaning company in the state certified by the Roof Cleaning Institute of America. We would be happy to provide you with a free demonstration of the results you can expect from having us professionally clean your roof. Contact us at (831) 677-2313 today for more information. Roof Cleaning - Soft Wash vs Pressure Washing an Interview with Eric Schnaible by "Bay Area Homes For Sale"